Alexander Peroni from Hobart, Tasmania and member of The Go Kart Club of Victoria, left for Italy four weeks ago to race at the World Karting Series. 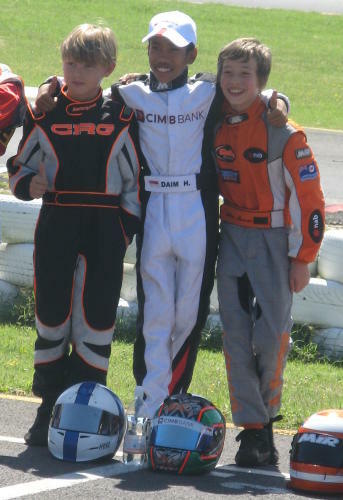 Although only ten years of age, this is now Alex’s third venture to race in Italy in the last eighteen months. 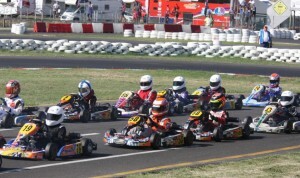 The class Alex is competing in is the 60cc Mini Class. On this trip to Italy, Alex has raced at two events with his best finish being 10th place two weeks ago at Siena. He is now undertaking several days of intensive testing in preparation for the next round which will be run at the Val Vibrata Circuit in Sant’Egidio next weekend. The top picture shows Alexander in company with Daim Bin Hishammudin of Malasia and Hugo Hakkinen of Finland during driver introductions prior to the commencement of the event. The bottom picture shows Alex on the starting grid just before the start of the race. Note the skinny tyres used in this class.